The Fourth Annual Little Village Art Festival is looking for you! For the past four years VILLARTE along with the help of Artists, Photographers, Performers, Educators, Students and others have converted empty storefronts, businesses and community centers into spaces of art and creativity for this three‐day event! Please join us as we once again celebrate the beauty of our community! 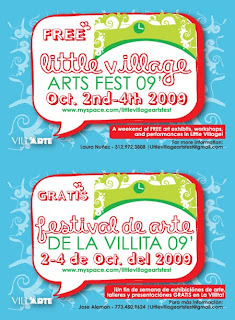 We are looking for all mediums of visual and performance art to be part of the The Fourth Annual Little Village Arts Festival running Saturday, October 4th and Sunday October 5th, 2009 with an opening night celebration on Friday, October 3rd, 2009. Our goal for the Little Village Art Festival is to reach all Artists living, working and/or inspired by the community VILLARTE calls home. All artworks should be dropped off at the VILLARTE Gallery Space located at 3348‐A West 25th Street, Chicago, IL (please no deliveries)! If you are an arts organization and would like to work with us to hold a workshop, volunteer or just help out, please contact Anthony Marcos Rea at the above mentioned email. Opening Night, Friday ‐ October 3rd 2009, LOCATION TBA! Locations: Various locations with a confirmed list and map TBA by the first week of September!